We’ve got your needs for deep cycle batteries covered! We can help advise and install it for you. Deep Cycle Batteries are designed to deliver sustained power over extended periods of time with low current draw, contrary to a car battery and marine batteries which are designed to deliver a sharp, short burst of power in order to start an engine. The construction difference between the engine starting batteries and Deep Cycle Batteries are toughest internal lead components and best design features for a long-lasting and dependable power in a diverse range of recreational and industrial applications. The Yuasa Deep Cycle Battery range includes low maintenance and maintenance free batteries which are designed to provide superior deep cycling performance. 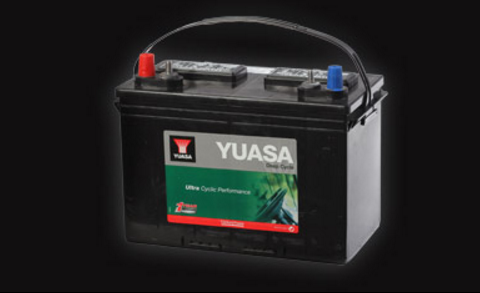 This range of Yuasa Deep Cycle Batteries is built to resist repeated cycling, using thicker plates and specialist antimonial lead alloys with denser active material. These design features also allow an easier access to the electrolyte levels. We stock 12V Deep Cycle Batteries 24DC, 27DC and 30DC. Visit our shop, give us a call on 094381980 to book your vehicle or boat in for a deep cycle battery fitment. What other Deep Cycle Batteries are available? At Wrack Auto Electrical in Whangarei we can provide you with Deep Cycle AGM , Deep Cycle Gel and Deep Cycle Industrial Batteries. AGM stand for Absorbed Glass Mat technology and makes these Yuasa Deep Cycle Batteries the top end of performance in high rate discharge applications. The AGM feature suspends the electrolyte within porous Glass Fibre Mat separators and you will never need topping up the electrolyte levels thanks to its sealed maintenance free design which avoids the possibility of acid spills or leaks. As the name already tells, these Deep Cycle Batteries run on a gel electrolyte technology gel batteries excel in slow discharge rates and slightly higher ambient operating temperatures. This range is perfect for hard-to-reach locations as the valve regulated design allows installations to be completely spill free. The industrial range of the Yuasa Deep Cycle Batteries is built to give the strength and durability needed in tough heavy duty industrial applications. They come with the most robust plate design and they provide long lasting power.